“It’s criminal to separate families,” Fox said of the Trump administration’s crackdown on unlawful immigration. Fox said that President Trump’s characterization of the trade deficit as a zero-sum game shows “absolute ignorance on how the economy works.” Companies in North America have increased production, he said, because of their partnerships and a developed global supply chain. Opposition to the North American Free Trade Agreement (NAFTA) is of course not cleanly partisan, but Colorado in particular is an exporting state that has seen economic growth and jobs from trade with Mexico–making an easier argument here than the Rust Belt for keeping the treaty in its substantially present form. You might not agree with Fox on this point, but it’s perfectly understandable why he’s making the case in our state. Once you reconcile where you stand on that issue, Fox’s comments about Donald Trump’s basic comprehension skills, and where Trump can stuff his proposal to build a wall on the Mexican border, should enjoy much broader consensus. There's a principled liberal not afraid to stand for something and call out horrible Republican policies. Fox/Hick 2020? Maybe our guv could learn a thing or 2. Uhh , Zappy, if you think Fox is a liberal, you need to study up on Mexicsn politics. Hint: PRI doesn't stand for Public Radio International. Actually, Vicente Fox was PAN's candidate (i.e., the National Action Party which is the right wing party in Mexico). But you are correct; he ain't no librul. 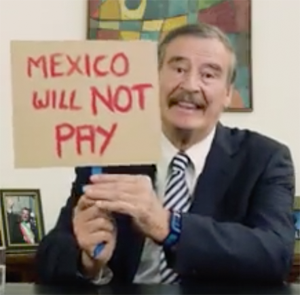 Mexico won't pay? What's a RWNJ to do now? How about, let's drain the remaining funds from America's disaster relief account . . .
. . . Haha, see, wasn’t that easy!?! FEMA's disaster relief fund is considered the Republican petty cash fund. They know it'll get replenished in a bipartisan funding bill, so no one will be the wiser, they hope. I will wager that more FEMA and other fed $ will be spent in TX than on ALL previous natural disasters combined. Then, since Houston is lower than sea level, we'll do it again, and again. The rebuild will never be completed as the disaster will recur almost every year. I feel incredibly sad for friends and relatives in TX. But, regulations protect life and property. Houston should have never been allowed to get even 25% as large as it is.